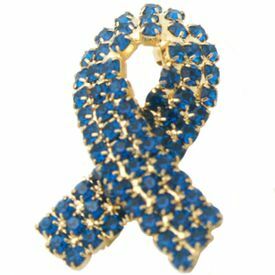 Child Abuse Awareness Rhinestone Ribbon Pin - These magnificent handcrafted rhinestone awareness ribbon pins have over 70 hand-set rhinestones, plated in 14kt gold and has a C clasp for easy attachment. The picture does not do this piece of jewelry justice. It sparkles, sparkles, sparkles. The rhinestones are set so tightly, that you won't have to worry about them popping out. These are of high quality materials. Measures 1 1/4" x 3/4" wide. C clasp for easy attachment. Over 70 hand-set rhinestones and 14kt gold plated. Make sure to see our full selection of Child Abuse Awareness products for more great ideas and gifts.